We spell them differently and we pronounce them differently, but English speakers still use these words incorrectly. Luckily, they’re easy to distinguish. Lose – pronounced with a “z” sound – is a verb meaning to not have something anymore, to be unable to find something or to not win. You lose your cell phone, or you lose your way while driving somewhere. I don’t want my football team to lose the game. She will lose her money if she gambles with it. Loose – with an “s” sound – on the other hand, is an adjective that means free, unattached or not tight. It’s also a verb meaning to untie or let go of something. The door handle fell off because it was too loose. A loose sweater feels very comfortable. Another common mistake people make is with the word loser, meaning a stupid, uncool or unfortunate person. You can say “You’re a loser.” But don’t call someone “a looser.” If you do that, then you’ll be the loser! This one is a little tougher. These two words have identical spellings – except for the hyphen – and opposite meanings. My boss didn’t want to increase my salary so I decided to resign. This will be my last week of work. Re-sign — with the hyphen — means to sign a contract again and it usually also means that you’ve decided to stay in your current job! In re-sign, the “s” is pronounced as an “s,” and you emphasize the first syllable. I love my current job, so I happily re-signed for another year. With these words we have similar spellings, similar meanings and only a slight difference in pronunciation. Advice — with an “s” sound — is a noun. You can give your friend some advice. Advise — with a “z” sound — is a verb. With this word, you can advise your friend. The meaning of the two words is basically the same. She advised me to invest my money more carefully. Again, with these two words the main difference is grammatical, although they’re pronounced slightly differently. Usually, affect is a verb and effectis a noun, and they’re used when talking about the results or consequences of particular actions. I’m worried that your lazy habits will affect your studies (your lazy habits will have a bad effect on your studies). Before you start an argument with your boss, consider the effects of your actions (before you start an argument, consider how your actions will affect the situation). Compliment — If someone says to you “I really like your shirt” then they’re complimenting you. In other words, they’re giving you a compliment. As a verb and noun, compliment means saying something nice about someone. I complimented my sister on her delicious cooking (verb). I gave my sister a compliment on her delicious cooking (noun). Complement — is when two things go well together, or complete each other. This word is often used in food and in fashion to describe matching styles or ingredients. My blue tie really complements my white shirt (my blue tie and white shirt go well together). That wine complements the meat dish well. Many native speakers use these two words with the same meaning – bored, or not interested. That’s certainly the meaning of uninterested, but it’s not the meaning of disinterested. The real meaning of disinterested is impartial, objective or not taking a side in an argument. A judge hearing a court case should be disinterested, but definitely not uninterested! The children wanted to play outside and were very uninterested in doing any studying. Sometimes a stranger can make a disinterested and fair decision more easily than a family member. These days, many people believe that disinterested can also mean uninterested. But it’s still helpful to know the difference. Bear — as a verb — has several meanings, including to hold up or support a heavy weight and to suffer or endure difficulties. We’re not talking about big hairy bears that live in forests. Don’t stand on that old chair, it cannot bear your weight. I cannot bear to see my son in pain. 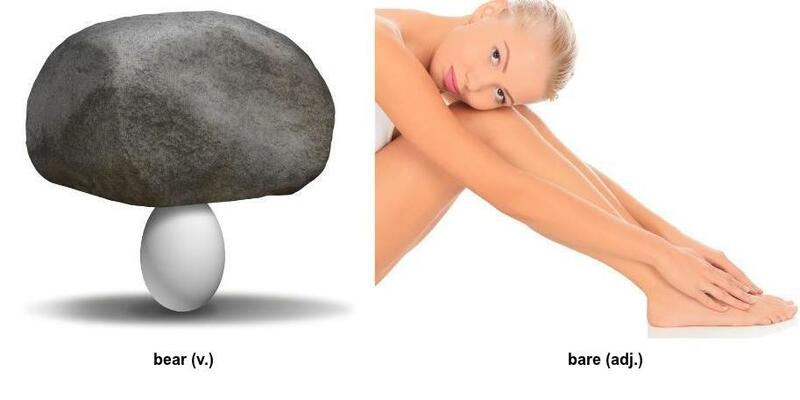 Bare, meanwhile, is an adjective that means naked or uncovered, or a verb which means to uncover or reveal. Visitors to the temple must not have bare arms or legs, so wear long pants and a jacket (adjective). I bared my arm to show them my new tattoo (verb). These two are very confusing. Further and farther both have the same meaning but are used in different situations. They’re pronounced in a similar way too, but with a difference – fur and far. Farther — with far — is used when we’re talking about physical distance. Further — with fur — is used for more abstract situations. If we drive any farther tonight we’ll be too tired to continue driving tomorrow. We should discuss this topic further before we make a decision. The difference between hanged and hung can be deadly. Hung is the past of the verb to hang, most of the time. I hung the painting on the wall and I hung my clothes on the clothes line. Hanged is the deadly exception, as it’s the past tense of hang in one very particular situation. Hang can also mean to execute a criminal by hanging them with a rope. In that case, the past tense of hang is hanged. The judge sentenced the murderer to be hanged. The criminal was hanged in the prison.